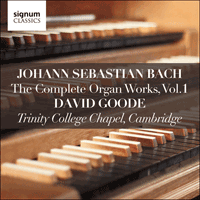 A grand new series on Signum will present the complete organ works of Johann Sebastian Bach in crystal performances from David Goode on the 1976 Metzler organ of Trinity College Cambridge. Although the most well-known of Bach’s organ works, as well as the most frequently transcribed for other instrumental forces, the authenticity of BWV565 as we now have it has been persuasively contested. It seems unlikely that the work was written originally for organ, that it was originally by J.S. Bach, or that it was given originally in its traditional key of D minor. Peter Williams demonstrates that a better fit for much of the keyboard writing of the work is string music, suggesting that it is probably an organ transcription of a violin work. Whatever the truth of its genesis, however, the fact remains that in the popular imagination BWV565 is pre-eminently emblematic of Bach’s organ music. The famous octave figures at the opening give way to a short toccata, dominated by arpeggiations. The Fugue, initially more leisurely in feel, is also characterised by harmonically straightforward quasi-string writing, ending with famous dazzling passagework and (uncharacteristically) a plagal minor cadence. There is much thematic linkage between Toccata and Fugue, for example the openings of both feature the descending scale from the dominant to the tonic. The Six Sonatas date from c.1730 and were probably written as practice music for J.S. Bach’s son Wilhelm Friedemann. They show some Italian influence but do not represent new works: some movements of the Sonatas are revisions of earlier versions. The first Sonata, in E flat, not necessarily intended as the first in the set, probably contains only one movement (the middle) that was composed new. The first movement opens with a motive built from an initial rising triad, repeated throughout. The slow Adagio movement is, like the first, set in a plain binary form. Its attractive opening melody features a falling triad shape that nearly—and neatly—mirrors the opening motive of the first movement. The third movement, an Allegro, is also cast in a binary form. Its solid opening scalic figurations balance the triadic shapes of the first two movements, but soon give way to energetic semiquavers. The title of the work highlights its French influence, although its exact wording is not commonly found in French music. The Pièce is in three sections, possibly linked by a common pulse; each is unique and each pursuing a single musical feature. The first is dominated by an insistent semiquaver figure, developed into virtuoso scales played solely on manuals and in a dancing compound time; the second by a gravement quality that is marked by a dense counterpoint and a deftly managed harmonic scheme based on rising scales in the pedal; the third a passaggio that traces broken chords heavily laden with dissonant passing notes. Its tripartite division has given rise to a popularly-held view that Christian Trinitarian symbolism is intended; yet though suggestive because of some musical features (the Holy Spirit’s ‘rushing wind’ of the third section seems the most appropriate designation) such an intention is impossible to prove. The six Schübler Chorales date from the end of Bach’s life, from between 1746 and 1750. Five of the six are transcriptions of earlier cantata movements, but their purpose as a collection is unclear: the title-page tells nothing more than that the collection was published by Johann Georg Schübler at Zella. More recent scholarship has highlighted the evidence of thoughtful planning in the key structure of the set, as well as the theological thematic connections present between the implied texts of the chorales. The six Chorales are clearly organised carefully, with the three minor-key settings being framed by the three in major keys. Further, the key relationships among the six Chorales are connective: the two inner pairs projecting four keys, each related by a minor 6th interval—E minor/C minor and D minor/B flat major—with the framing two settings presenting keys related by its inversion, a major 3rd—E flat major and G major. One perplexity of the cycle is why Bach substituted the original cantata text of the final chorale (‘Lobe den Herren’) with a different text for its title (‘Kommst du nun, Jesu, vom Himmel herunter’). Albert Clement finds a reason in that the new text more neatly fits with the eschatological theme of the first chorale of the collection, thus giving a theological bookend of the second coming of Christ. It has been suggested that, in fact, this theme is common to all the texts of the set, an insight that finds Clement theorizing that Bach’s intention in assembling the six Chorales was to not only to create a musical legacy, but also to preserve his spiritual legacy: the collection may represent an effort by the composer to prepare for his own impending death. ‘Wachet auf’ is a transcription of a movement from Cantata 140. The cantata movement sets the text of verse 2 of the chorale, given in the left hand in the organ setting, and an analysis of Bach’s text-setting is revealing, illuminating some of Bach’s musical choices. The famous anapaest (short-short-long) rhythm of the opening of ‘Wachet auf’ derives from an embellishment to the chorale melody heard in the original cantata version on the word ‘springen’ (leap)—and suggests the joy of the watchmen at the coming of Christ, that forms the subject of the verse. This is the only Schübler not to derive from an original cantata movement. The two titles are Bach’s and reflect a common pairing in Thuringia, the geographical region from which Bach’s family originated, though it is the first title that, pictorially, is most clearly suggested by the musical figures used. The opening seven-note semiquaver figure surely denotes ‘fliehen’ (fly/flee), as does the fact that in the initial episode the left hand literally ‘flies after’ the right in exact imitation. The chorale here is given in the pedal, with the left hand suggesting a basso continuo role. The third chorale, in C minor, takes a movement from Cantata 93 of the same name which sets verse 4 of the chorale text. The text highlights one word, ‘Freuden’ (Joy), projecting it as the movement’s dominant affect, a fact perhaps reflected in the opening dactyl (long-short-short) figure, heard in the organ version at the outset in the left hand, and which saturates the texture throughout. The chorale melody can be heard in the pedal. The fourth Schübler sets a chorale from Cantata 10, which is based on the text of the Magnificat. The chorale—the tonus peregrinus—is given in the right hand, and results in a setting that, with its sometimes awkward spacings in the left hand, requires imaginative dexterity by the player. The opening pedal motive traces a chromatic fourth, hinting at a darker affect than the text might suggest, yet which is rendered less obviously chromatic in its original (cantata) form. Keller suggests that the head motive of BWV648 is symbolic of bowing, and thus of the humility found in the Magnificat’s text. The final chorale, a trio G major setting in 9/8 with the chorale in the pedal, sets a movement of Cantata 137. As mentioned above, in its original version the cantata text is different from that of Bach’s Schübler title, a change that creates a theological symmetry with the opening Schübler chorale, ‘Wachet auf’, which like ‘Kommst du nun’ is also an Advent text. In the original cantata movement, the text highlights the providential directing of God for the believer, His leading on ‘eagle’s wings’, perhaps an image that explains the characteristic semiquaver figures at the start of the piece. The Prelude and Fugue, BWV533 is not to be confused with its longer and more substantial cousin, BWV548. The opening improvisatory section of the Prelude explores the tonality of E minor and is followed by a main section that is full of short gestures, many derived from diminished seventh chords. Its middle is an attractive dialogue between manuals and pedals, reminiscent of Buxtehude and full of suspensions and pedal runs. The highly-wrought harmony of the Prelude is balanced with the cleaner counterpoint of the Fugue, whose subject is characterised by a simple repeating one-note gesture. This manualiter chorale is like BWV727 in its expression of faith in God during personal suffering, but is given an opposite character, perhaps animated by the Hoffnung (hope) of the text’s opening line. It is dominated by a lively affect, propelled forward by a 12/8 time signature and initial anacrusis. The exclusively quaver figurations of the first half are balanced by the introduction of semiquaver figures in the second. The Prelude and Fugue in C minor, BWV546 is possibly a Leipzig work; yet it is often noted that there is a stylistic discrepancy between the Prelude and the Fugue that hints at two separate origins, with the Prelude representing a later date. The Prelude is in an Italian concerto ritornello form, although as Williams notes, the opening only returns in its full form at the end. It is a substantial piece, with a dominant tragicus affect, suggested by granite-block chords, twisting diminished harmonies above long tonic-pedal notes, and dramatic Neapolitan sixths. The Prelude is characterised by a rhythmic subtlety, the episodes driven forward by triplets that form a countersubject to a strikingly simple scalic motive. The Fugue, with its contrasted character, suggests an earlier date of conception; some of its more wayward episodic writing is uncharacteristic of Bach and has given rise to suggestions that it may be the work of other composers. Yet, for all its balancing contrast, from its subject onwards there are notable similarities that explain its pairing with the Prelude: the scalic emphasis of the subject, and its outline in bar 3 of a diminished seventh. Initial crotchet movement gives way to flowing quavers that soon dominate, with the final bars reaching the heights of intensity and expression found in the Prelude.